Amaze your family, friends and colleagues by challenging them in Multi Player mode... there is nothing more entertaining than playing together. :-) For those SOLO souls out there, scary slippery snakes and superfast ladders are waiting for you. Let computer player challenge you one to one. 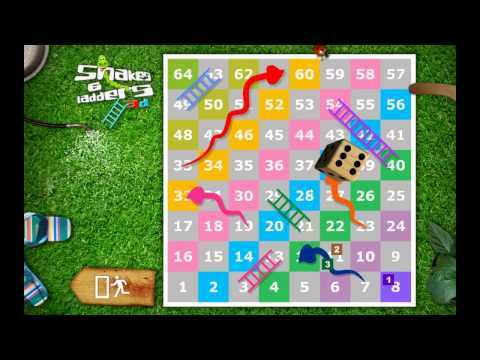 Recall your childhood fun times without harming environment by playing Snakes & Ladders 3D on your phones or tablets and save paper :-) and yes, we have made this game so easy to play, to start or stop game, you have to push just ONE button. It’s so easy to use, even kiddos can operate it on their own! Snakes & Ladders 3D is specially optimized for mobile & tablet devices to make sure graphics and numbers are easily visible on even the smallest screens. > ONLY Snakes & Ladders having Multi Tapable 3D Rolling Dice (MT3RD)... Use you dice rolling skills like never before. > Enjoy playing together with family members, friends and colleagues in Multi Player Mode. > Play with your phone/tablet/computer AI when you are SOLO. > Very easy to use! Just ONE click to start or stop game! > Pleasant surprise for Environment Loving People, Play in your virtual backyard garden with bird chirping soothing natural sounds... a truly peaceful experience.